Carnival of Blogs on Golden Era of Hindi Film Music : November, 2018 – The world is too small? or Is it? Welcome to November, 2018 edition of Carnival of Blogs on Golden Era of Hindi Film Music. We will take up posts dedicated to commemorate 51st death anniversary of Roshan as THE topic for November, 2018. Early Days of Roshan is the first of the two parts that takes us through Roshan’s relatively less known journey of 1950s. In the concluding post, well-known, years 1960-1968 – part of Roshan’s career has been covered. Roshan had his usual creative flavor even in the relatively less-known films like Warrant (1961) in this period, as can be seen in the songs as diverse as Hothon Pe Hasin, Ankhon Mein Shararat Raheti Hai (Lata Mangeshkar), Nigahon Mein Yeh Masti Kyon Kyun (Geeta Dutt), O Beimaan Maine Tujhe Pehchan Liya (Asha Bhosle). Rafi’s duets by Roshan – Out of the total 92 Rafi-Roshan songs, solos are about 35 and duets 57. Third of Roshan’s Rafi songs belong to eleven years of 1949 to 1959,, and two thirds belong to the nine years of 1960 to 1968. A Eulogy that Touches the Heart – Three-quarters of a century back, a child prodigy from Punjab, the sensational vocalist named Master Madan used to electrify live audiences with his light classical singing of ghazals, thumris and Punjabi gurbanis. But before he became 15 years old, the boy passed away as a result of mercury poisoning, if the rumour is true. He was able to cut just 8 records, through which he is immortalized, especially for rendering two ghazals written by Sagar Nizami: Yoon na reh reh kar humen tarsaaiye, and Hairat se tak raha hai jahaan-e-wafa mujhe…. Our films have featured kids in hundreds of situations as well as songs. On Jawaharlal Nehru’s birthday, Bal Din, the post lists some songs now, but only those where children themselves sing, without any adults singing with them. 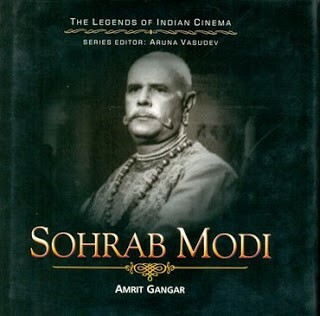 Sohrab Modi – His films always carried Social or National Message – (born 2 November 1897) a great filmmaker of the 1930s 1940s.and 1950s. He launched Minerva Movietone in 1936. S D Burman Was Someone Who Adjusted To Changing Times, Therein Lies His Greatness – Anirudha Bhattacharjee – The entire book, S D Burman – The Prince Musician, by Anirudha Bhattacharjee and Balaji Vittal, is full with trivia, minutest details of his work, his career, his unreleased songs, the work which went unnoticed and yet the book focuses on what it should be focussing – his music. Usha Uthup – A Journey from Night Club to Bollywood – recorded covers of two pop songs in English, “Jambalaya” and The Kingston Trio‘s “Greenback Dollar”, on an EP. 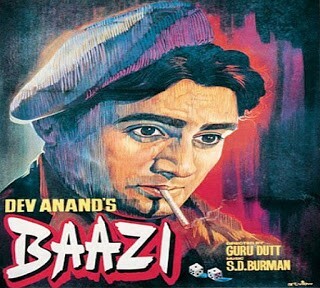 Baazi- The Film that was a trendsetter and gave Bollywood many Legends, like Dev Ananad as a hero, Guru Dutt as a director, S D Burman as a music director and the Kalpna Kartik, the future wife of Dev Ananad. On the 10th birthday of the blog, Dusted Off, Ten of my favourite songs from films I haven’t watched. In most cases, the films seem to have completely disappeared off the radar. November, 2018 episode of Fading Memories, Unforgettable Songs is dedicated to Salil Chaudhury’s composition of Shaliendra’s songs for the years 1953 to part of 1956.. When The Moon And Romance Go Together – Moon has fascinated and charmed the poets and the lovers alike. Poets have turned into lovers and lovers have turned into poets because of its beauty. We have folklores singing the praise of the moon too. Here is a list of few such songs. 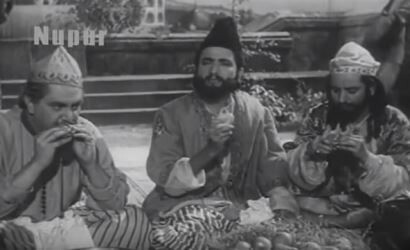 In continuing the Food and Food Movie Month on Dustedoff, The Food and Food Movie Project, Part 4 is followed by Onscreen Chefs: The Myth and the Reality, Ten memorable food scenes from Hindi cinema..
Top 20 Bollywood film soundtracks of Golden Era is a very representative selection from the films released in 1940s till 1975. Mi Raat Taakli Mi Kaat Taakli – Jait Re Jait – Liberated In Love – When Shailendra wrote, Tay Kar Liya… Aaj Phir Jeene Ki Tamanna Hai, Aaj Phir Marane Ka Irada Hai, little would he have known that he is going voice to thousands of women. Like Rosie of Guide, Maya of Maya Memsaheb are the examples of the women who had the courage to remove themselves from the situation in life which was unacceptable to them. Present song from Jabbar Patel’s Marathi Film Jait Re Jait (Win Win) is a classic example of art concealing the art. The film is about winning in life, but losing in love. The Punjabification of Bollywood – It was B.R Chopra. and Raj Kapoor led the ‘Punjabification’ of the Indian film industry. Punjabi music was first introduced by Gulam Haider. In the 50s and 60s, we saw the influence of Urdu and Muslim influence in Hindi songs and films besides Bengali. Urdu sounds are disappearing from Bollywood songs – Rizwan Ahmad traces the gradual decline of Urdu diction in Bollywood songs from Mughal-e-Azam to My Name is Khan. From BIG DATA to Small Cinema? Challenges & Opportunities of Cinema in New Media – The rate of increase of mobile internet subscription is extremely fast .. With ‘big’ data being harnessed by companies, the customer targeting has reached a new aggression. Cinema not only gets changed continuously with respect to the format and projection technologies but with the giant nation slowly but surely getting addicted to the small screen, the bigger question is with so much information about the audience preferences whether cinema is actually becoming ‘small’. Tere mere milan ki ye raina – Monica Kar discusses how Hrishikesh Mukherjee explores the shades of grey in the husband and wife relationship. We continue Micro View of Best songs of 1947: And the winners are? with the Duets of 1947, in terms of Female – Female Duets, Male- Male duet as Triads/Triads+, then conclude with a summary of MY Top Duets so as to end the Micro-View of Songs of 1947 with MY Top Music Directors. All the episodes of The Micro View of Best Songs of 1947 can be read / downloaded from one file, by clicking on the hyper link. In our tradition of ending our post with article on Mohammad Rafi or a topical song of his, I have picked up a few songs, each one of which basically has a link with the topics discussed in the present post. I earnestly seek your suggestions / inputs / criticisms so as to make our Film Blog Festival more interesting and live. Very nice , i like old classical songs & films. Thank you so much for your very kind appreciation. Next Next post: Business Sutra |9.1| Gender: Is Man superior to Woman?